One of the most magical things about Christmas Town is the snow. 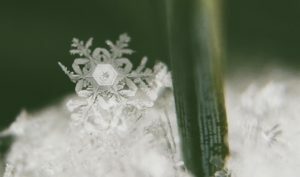 Did you know a square foot of snow contains around a billion snowflakes? And every single one is an individual work of art. It all starts high in the sky with a cold droplet of water. The droplet freezes onto a pollen or dust particle and forms a six-sided crystal. This crystal is heavier than air, so it begins to make its way toward the ground. But along the way, the tiny crystal encounters water vapor. 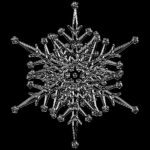 This water vapor freezes onto the six sides of the existing crystal, and the “arms” of the snowflake begin to grow. Just exactly how the arms grow is influenced by temperature, wind, static electricity, and humidity. Temperature is especially important. At 23 degrees F, the crystals tend to grow long and needlelike, but at 5 degrees, they’re flat, like plates. Higher humidity means more water vapor to form crystals. 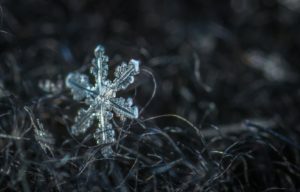 The time the snowflake takes to fall is important, as well, because it has more time to grow and produce bigger flakes. 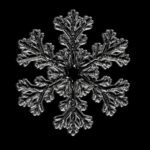 Because conditions are constantly changing as the snowflakes make their journey to the earth, the crystal shapes on the arms change as well. 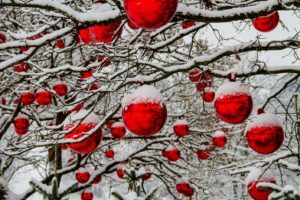 Since no two snowflakes take exactly the same path down from the sky, no two snowflakes are exactly alike. Every single snowflake is different and special, just like the people of Christmas Town.